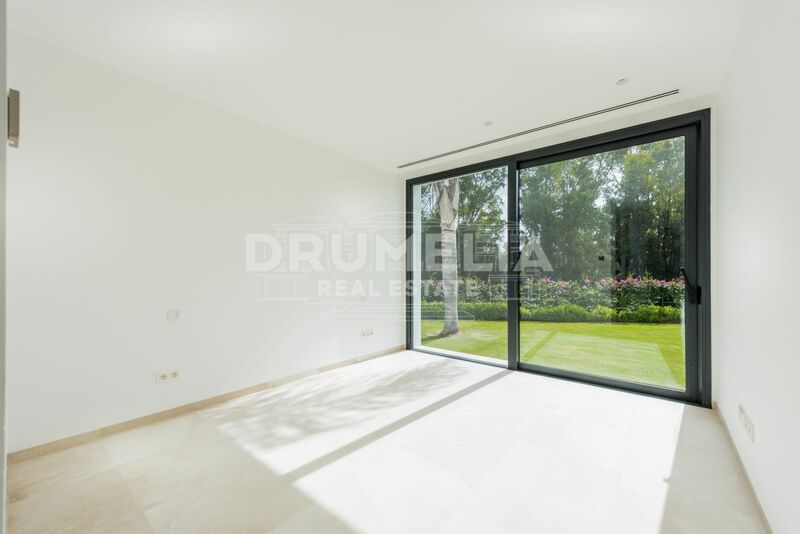 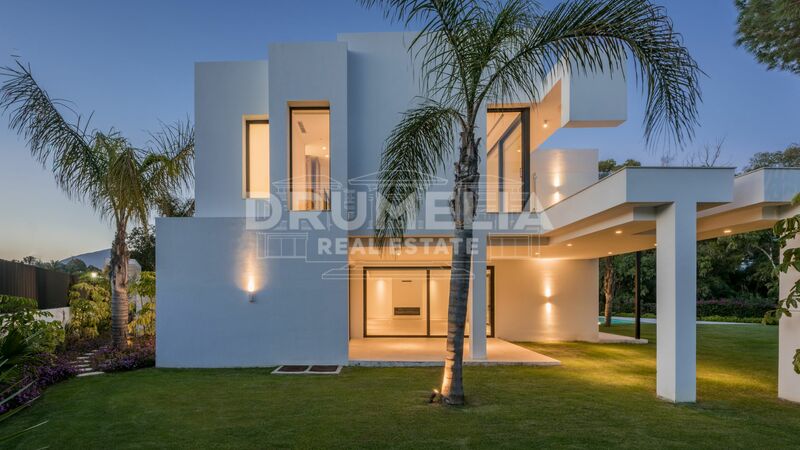 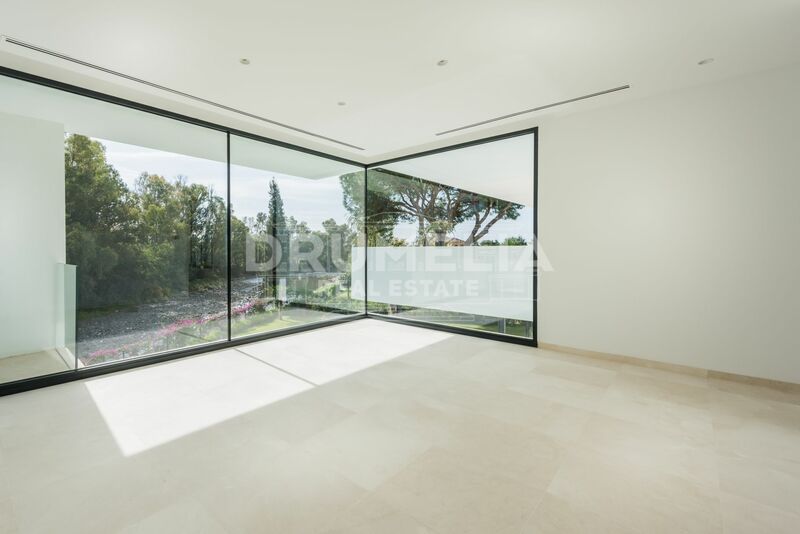 Excellent Modern Villa with plot of 1.262 m² bordering a beautiful river is located in the area called Casasola, a few meters from Padel Club of "Alhambra del Golf". 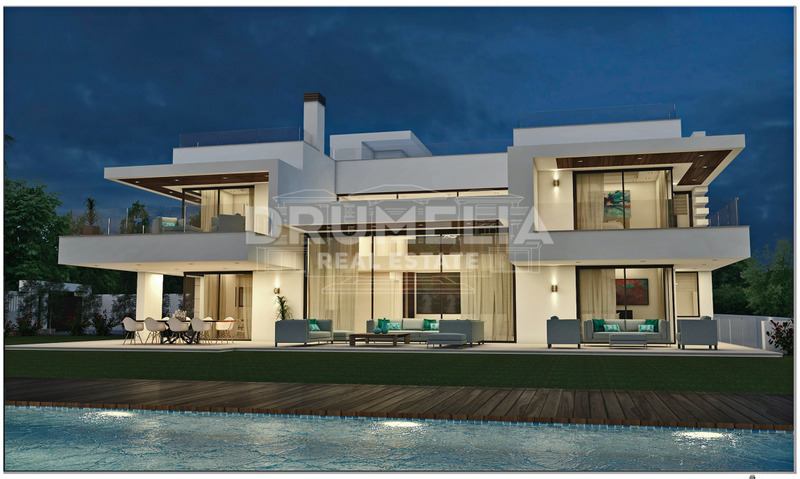 It will house an extraordinary contemporary villa with picturesque views towards the green zone of Guadalmina golf course. 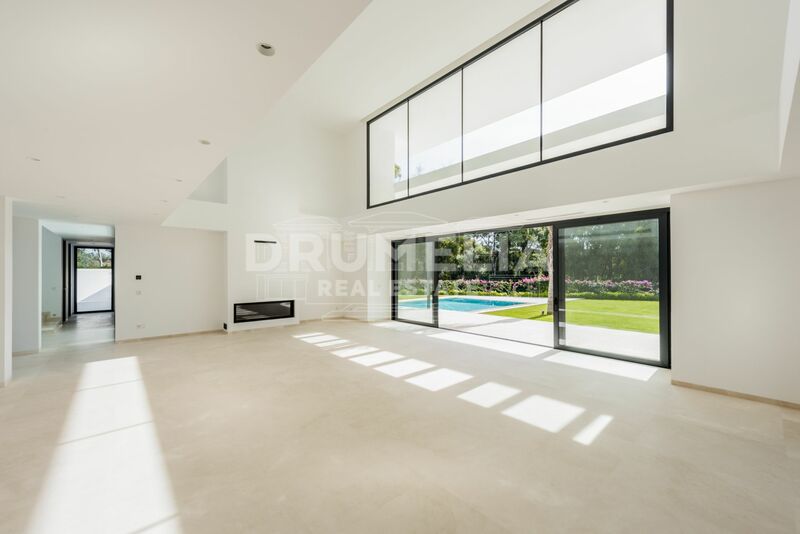 Giving a feeling of spaciousness, fabulous property will comprise: a basement, ground and first floors, terraces, solarium, pool and garden. 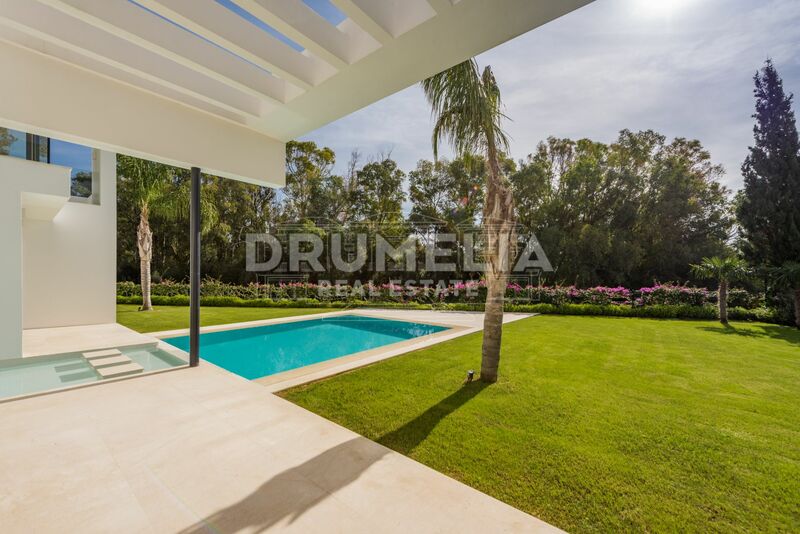 Lit in an artistic way, the landscaping is magnificent with several tall palms, green lawns and diversity of plants. 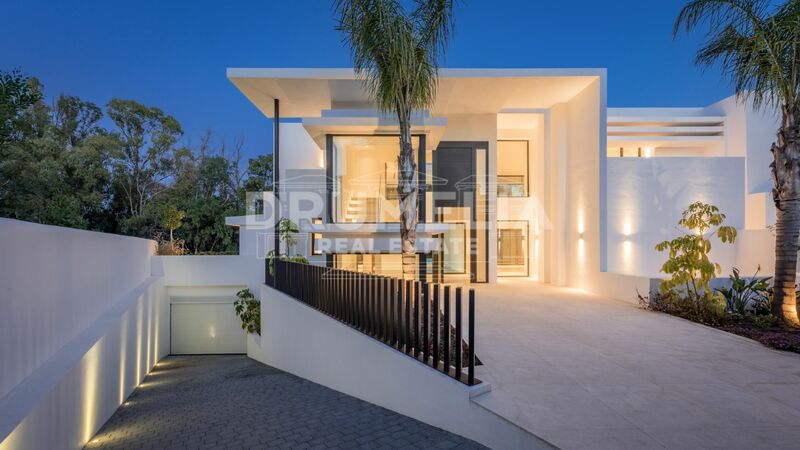 Southeast facing house of 800 m² with contemporary façade of strong emblematic character, with concrete architectural elements and a spectacular, black on a white background entrance door of 5.5 meters height will invite to an entrance hall with double height ceiling and views through a large window towards the pool with illuminated water slide, living room also with double height ceiling, large floor to ceiling windows and fireplace, terraces, TV room, guest toilet and pre-installed kitchen. 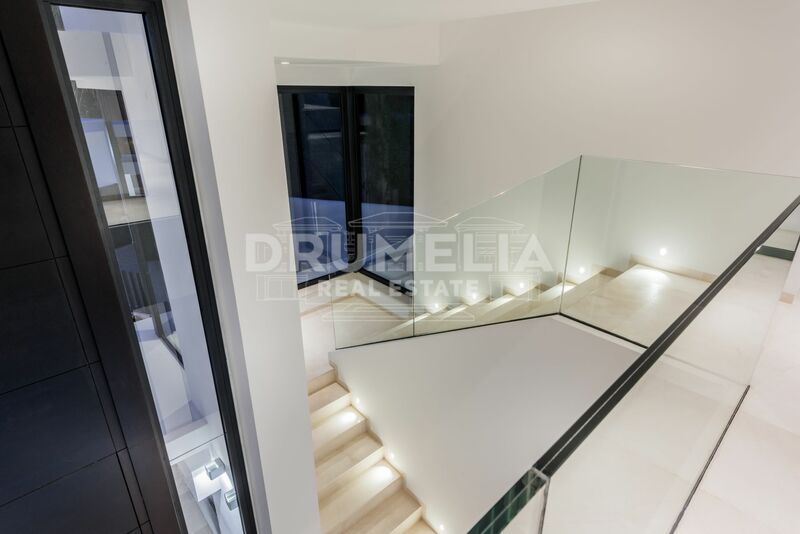 The ground floor will also have 2 large bedrooms en suite overlooking the river. 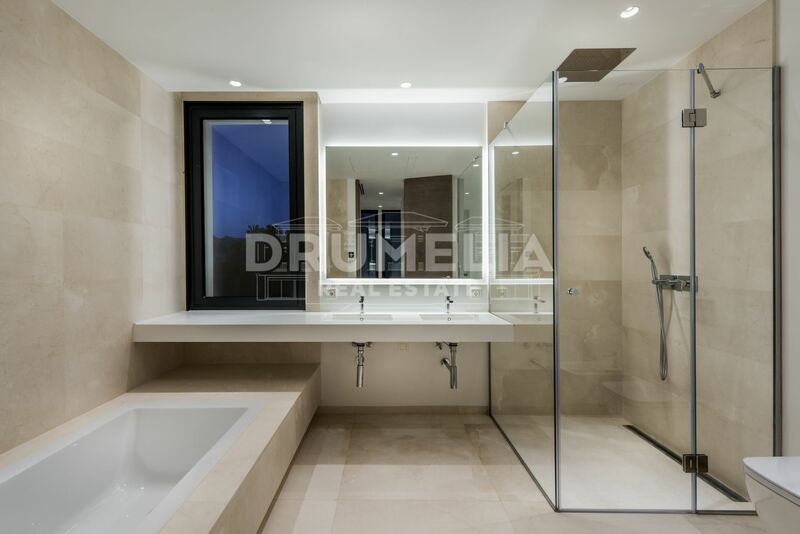 The first floor features bedrooms – Master suite with dressing room and terrace with magnificent views, and another bedroom with en-suite bathroom. 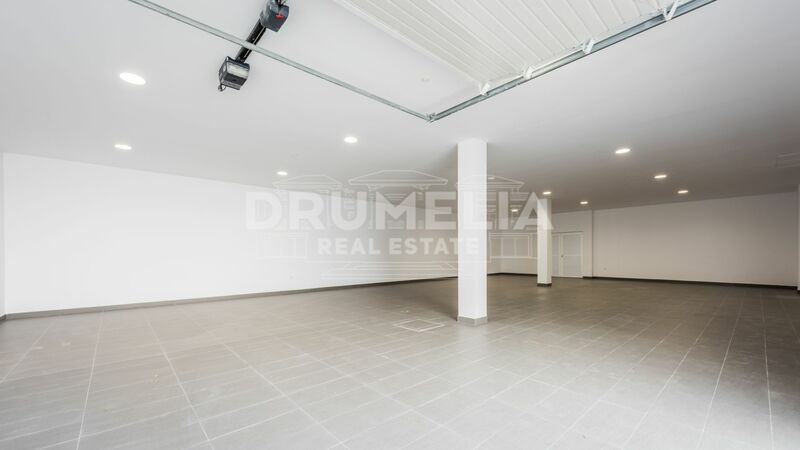 The basement will offer a garage for 4 or more vehicles, several rooms and extra space with exciting possibilities for relaxation and entertainment that can be tailor-made and distributed to the buyers’ taste (gym, SPA, wine cellar, cinema, game room, 2 additional bedrooms -the choice is yours!). 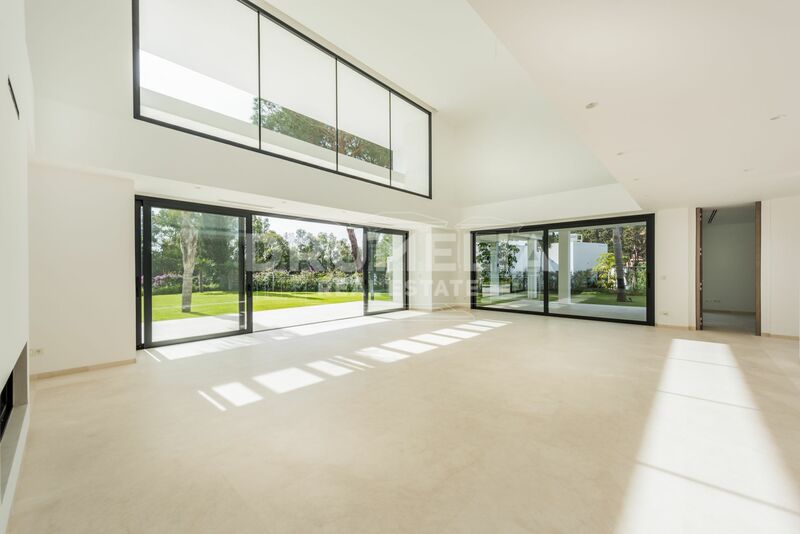 The design is modern, bright and luminous with floor to ceiling windows producing a seamless effect between indoor and outdoor spaces, and an open plan creating a unified design aesthetic throughout the home. 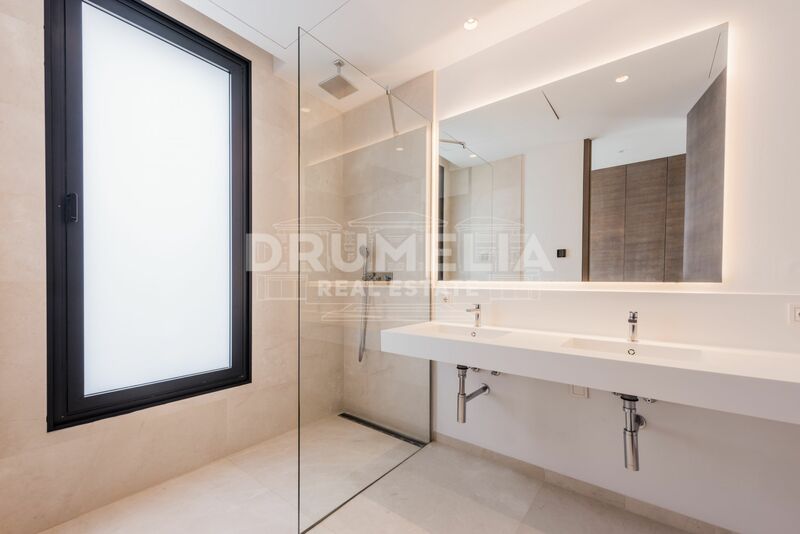 Natural materials are a must in contemporary living and it is proved by Crema Real Bianco marble floor with an elegant and refined appearance, oak wood flooring in bedrooms and interior carpentry (floor-to-ceiling dressing cabinets, etc). 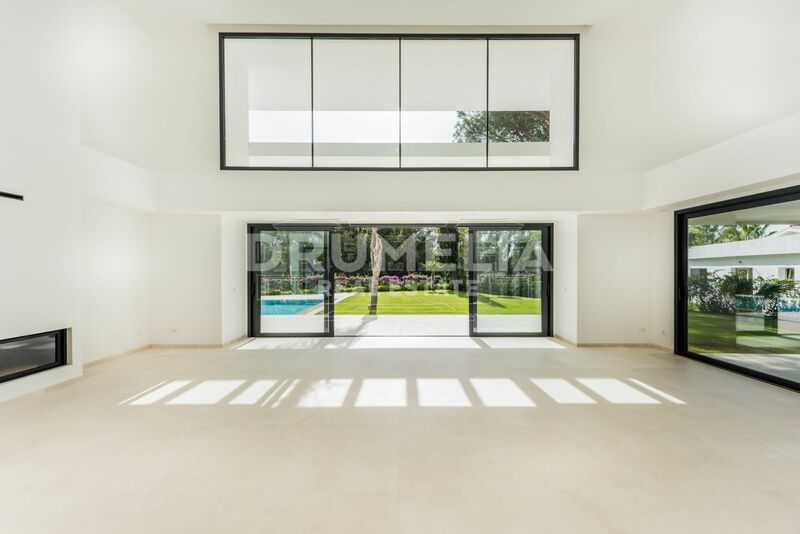 The quality is superb: aluminium Shücco products meeting the highest requirements of design, comfort, security and energy efficiency; safety glass; Domotica, intelligent lighting system "Lutron", air conditioning and underfloor heating offering aerothermal system with high energy efficiency; a salt filter system to sanitize a pool, etc. 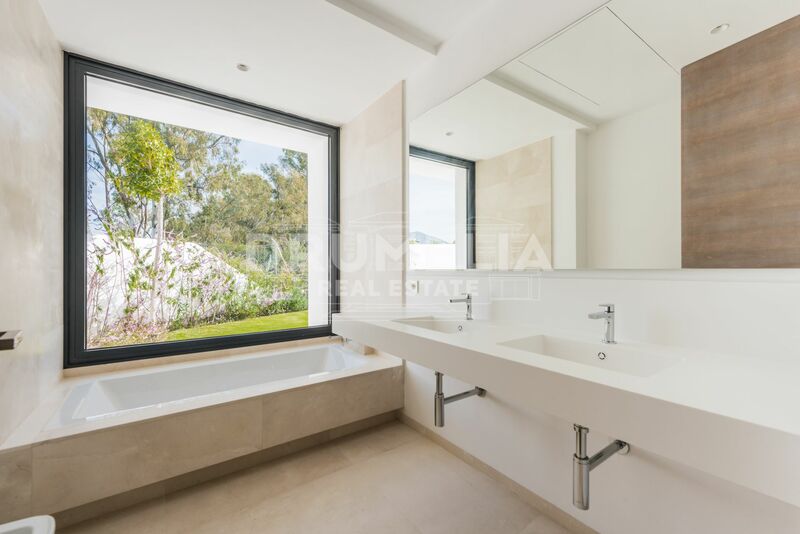 Guadalmina Baja with 24-hour mobile security, amazing scenery, protected historic areas and views over the mountains, Mediterranean, Gibraltar and African coast, is a mature mix of high-end villas interspersed with Andalusian-style townhouses and modern developments. 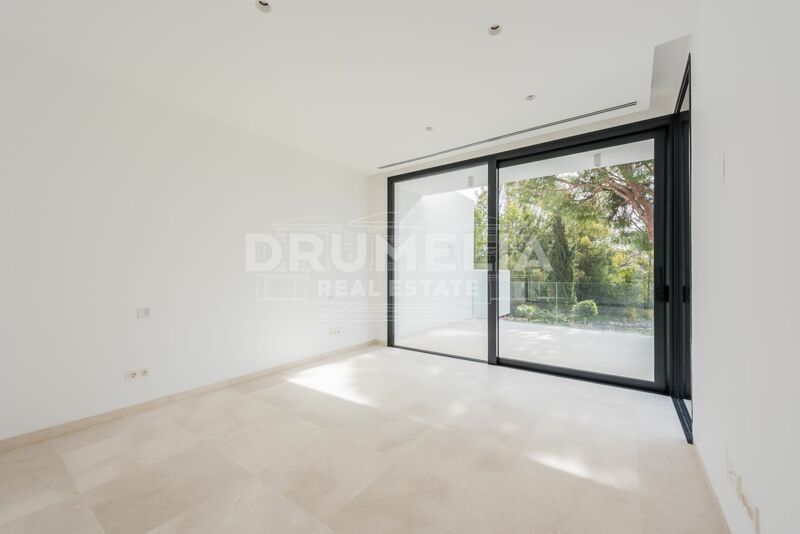 Bordered by Guadalmina river to the west, Arroyo del Chopo to the east, N340 coastal highway to the north (on the other side of which lies Guadalmina Alta), and the Mediterranean, it is a quiet, discreet part of Marbella, yet just minutes away from the bright lights of glamorous Puerto Banús and charming San Pedro. 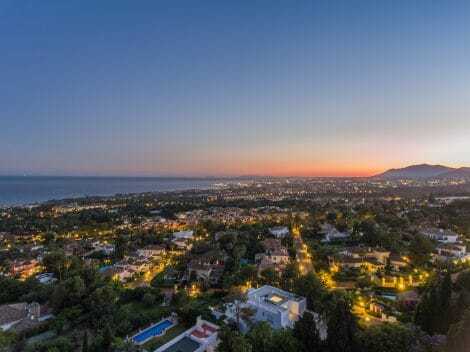 The area boasts Blue Flag beaches with fantastic water sports facilities, fine restaurants, seaside chiringuitos, its own shopping centre and all facilities of Guadalmina Spa&Golf Resort. 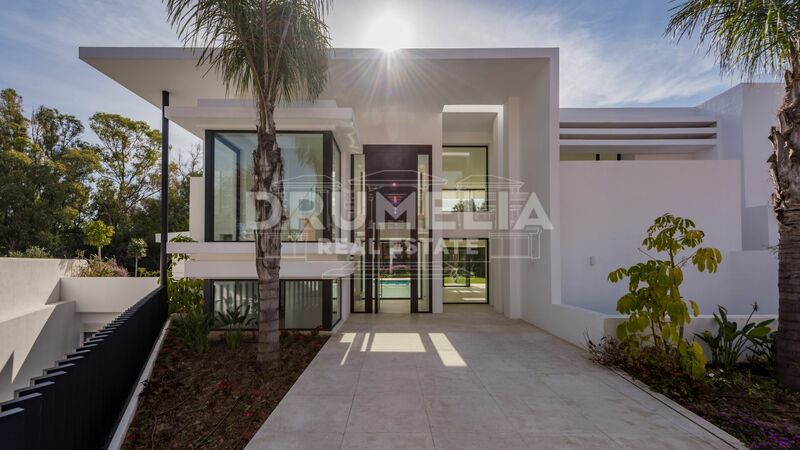 This property will offer an unprecedented lifestyle for those who appreciate the beauty of nature blended perfectly with modern lifestyle within luxury community always favoured by aristocratic families and Hollywood Golden Age stars, and still preferred by businesspeople and celebrities.